This convivial, New England–style joint was a forerunner of the city’s fish-shack trend. The outstanding lobster roll—sweet, lemony meat laced with mayonnaise on a butter-enriched bun—is Pearl’s raison d’être, but more sophisticated dishes fare equally well: A bouillabaisse features briny lobster broth packed with mussels, cod, scallops and clams, with an aioli-smothered crouton balanced on top—a great value at $20. For dessert, try a bittersweet chocolate mousse topped with a quenelle of barely sweetened whipped cream. Finally, a restaurant worthy of its hype. Lovely venue on a lovely street. Quality was good but not amazing. The halibut is a bit dry and they oysters were very nice ( in particular the fried). But I don't like the one varietal selection. Cozy but a bit rushed on the service. The lobster roll looked amazing at top dollar. I remember the clam chowder being better than the lobster roll here. 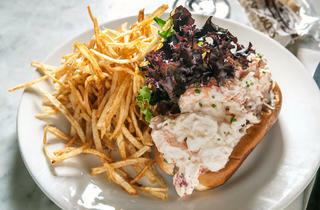 It's a solid lobster roll but not the best I've had, and it comes with true shoestring (super thin) fries. Very small venue and my friend and I had to eat smushed up against the wall on stools. Ok choice if you're in the area but not really worth going out of your way for. 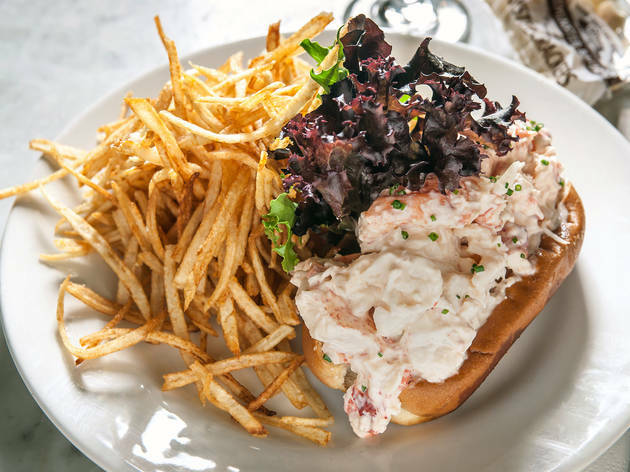 Interesting that you state this is the city's best lobster roll because all that I see is a pile of mayonnaise.